This book captured my attention as I made a quick pass through Borders Books Thursday afternoon. I didn't pick it up and look inside because I'm not a complete idiot. Maybe I should be. I'm guessing this means that the Complete Idiot's series is nearing the last of their suitable topics. 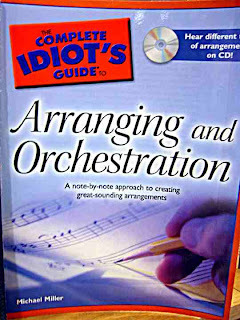 Here's a list of available Complete Idiot's Music and other Performing Arts Guides. "I'm guessing this means that the Complete Idiot's series is nearing the last of their suitable topics." I bet they do market research into titles that will capture enough to go profitable. Lord knows there are enough of us who would probably say "sure" if asked to write such a thing (for a tiny bit of quick cash and hopes of royalties). Production costs have gotten low enough, if you have it systematized as these people probably do, that no particular title needs to do great, it is comulative across all the titles. Still, although I severly doubt it would happen, I sure would get a chuckle to someday hear an interview where the newly crowned great man of music admits his start from reading this book. As a matter of fact, I think I'll start blaming the end of my career on that book ("it taught me everything I know! "), and let the Conservatory off the hook (they blush and look away everytime I boast of my attendence).